Michelle Glaus works as a full time sales agent specializing in the Santa Barbara and the Santa Ynez Valley areas. A 45 year resident of Santa Barbara County, Michelle was raised in the Santa Ynez Valley and moved to Santa Barbara in the early 90’s. Michelle is married to Richard Glaus, Retired Deputy Chief of the Santa Barbara Police Department. After raising their four now-adult boys in Santa Barbara, they moved back to the Valley in 2009 with their teenage daughter and live in Los Olivos. Prior to becoming an agent, Michelle had a 30 year professional career with real estate development firms, land use planning firms and general contracting firms. Her experience as a corporate contract administrator and her attention to detail suit her perfectly for the ever changing complexities of the real estate industry. She is the consummate professional and will represent you with the highest integrity and confidentiality. 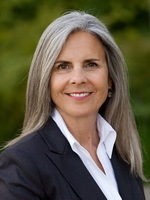 Her professional memberships include the National Association of Realtors, California Association of Realtors, Santa Ynez Valley Association of Realtors, the Santa Barbara MLS and the Santa Ynez MLS. Michelle currently serves on the board for the local chapter of National Charity League. In her free time, Michelle enjoys exploring the wine country with her husband, supporting her children in their activities and horseback riding.